In recent days, the U.S. Census Bureau released new 2017 data covering poverty, income, and health insurance coverage. Moving to a less regressive statewide tax system for families while closing corporate tax loopholes to assure stronger investments for all Iowans would work to dismantle some of the barriers to economic success for all Iowans and particularly families of color, who the latest data show are disproportionately impacted. An EITC increase would raise the threshold at which Iowa families start to owe income taxes — putting more money into the pockets of those who need it the most and encouraging them to spend that money in their local communities. If you imagine a packed Kinnick Stadium on game day you have an idea of how many Iowans were kept out of poverty from 2009 to 2011 thanks to two refundable tax credits. A new state-by-state analysis from the Brookings Institution finds that the federal Earned Income Tax Credit (EITC) and Child Tax Credit (CTC) kept 71,123 Iowans out of poverty, over half of them children. The Governor’s Condition of the State speech Tuesday missed an opportunity to discuss the value of Iowa’s own Earned Income Tax Credit (EITC) to Iowa families and prospects for an expansion — something he has twice vetoed on grounds that he wanted more comprehensive tax reforms. The Brookings analysis uses a new way of looking at poverty: the Supplemental Poverty Measure, an updated approach to the calculation of whether an Americans household is in poverty. So it’s a valuable look that we haven’t seen for state-level figures. The EITC is designed to encourage work when low-income jobs don’t provide enough for a family to make ends meet. So, as a family earns more income, they become eligible for a larger credit; as their income approaches self-sufficiency the EITC gradually phases out. At the state level, Iowa families who are eligible for the federal EITC also qualify for the state EITC, which is set at 7 percent of the federal credit. Proposals in the past would take that higher, to 10 percent or even 20 percent. It can be an important break for lower-income working families because Iowa already taxes the income of many who don’t earn enough to pay federal income tax. Currently, a married couple with two incomes and two children who qualifies for the federal EITC doesn’t have to start paying federal income taxes until their incomes reach $45,400. That same family would have to pay Iowa income taxes when their incomes reached $22,600. The EITC is the the nation’s largest and most successful anti-poverty program, largely because it encourages and rewards working families. With Iowa’s 85th General Assembly under way, discussions about raising Iowa’s EITC above 7 percent may once again emerge after lawmakers failed to reach an agreement last year. Make no mistake: Working Iowans pay taxes. The current political environment has set off a firestorm of confusion about who does and who does not pay taxes in America — and unfair criticism of many working families and others. It’s true that 47 percent of Americans pay no federal income taxes, but they do pay taxes. In fact, almost two-thirds of the 47 percent are low-income, working households who are paying payroll taxes to help finance Social Security and Medicare, and many pay federal excise taxes on things like gasoline, alcohol and cigarettes. These households are also paying a large percentage of their income in state and local sales and property taxes. Many working Americans are exempt from the income tax because of features Congress added to the tax code — with overwhelming bipartisan support, in an effort to enable people to care for themselves and their children while encouraging them to work. Some of these features include the Earned Income Tax Credit, a Ronald Reagan era anti-poverty program that enables low-wage working families with children to meet their basic needs while promoting employment. In addition, the child tax credit gives families a tax credit through the form of a refund check even when they don’t owe federal income taxes. The other one-third of the 47 percent — those households that aren’t paying either major federal tax — includes those who are unemployed, low-income senior citizens who paid taxes during their working years and aren’t currently taxed on Social Security benefits, students, those who have disabilities or can’t work due to serious injury and people who don’t meet the income tax obligation because their wages aren’t high enough. Often missed in the focus on those who are not currently paying income taxes is the errant assumption that all those people have never paid taxes and never will. Just because a household doesn’t owe income tax one year, doesn’t mean they won’t pay income taxes over their lifetime. For many, a career change, the loss of a job, a disability or injury, or low wages can lead to incomes too low to pay taxes. As the graph at right shows, Iowa’s regressive tax system takes a larger share of the incomes from those who have the least, and a smaller share from those who have the ability to pay a larger percentage of their income. Make no mistake: Working Iowans pay taxes. House vote: Thumbs up or thumbs down for 86,000 Iowa families? Simply put, the House bill would undo the good work of 2009; the Senate bill would keep it, on behalf of working families and the economy. Iowans would stand to lose much under a proposal this week in the U.S. House of Representatives. Citizens for Tax Justice offered a striking analysis last week highlighting the impact of the 2009 improvements in the refundable tax credits for low-income working families in Iowa. Simply put, the House proposal would undo the good work of 2009 and increase tax inequities, while a Senate-passed bill would keep the good stuff. One of the 2009 improvements is an expansion of the Earned Income Tax Credit (EITC), an issue we have covered extensively at IPP and the Iowa Fiscal Partnership. Any attempts to weaken the EITC at either the state or federal level will harm low- to moderate-income working families in our state. More than 1 out of every 7 federal tax filers in Iowa claims the EITC (about 15 percent). But under H.R. 8, the tax proposal being offered by the House leadership, the EITC improvements from 2009 would be lost. H.R. 8 also would fail to extend the improvements made in the Child Tax Credit (CTC) in 2009, and in the American Opportunity Tax Credit for higher education expenses. It is impossible to find balance in the approach of H.R. 8, which would end these provisions above for 13 million working families with 26 million children, while extending tax cuts for 2.7 million high-income earners. 17,503 Iowa families with 28,179 kids would lose $32 million if the Per-Child Tax Credit earnings threshold does not remain at $3,000, compared to $13,300 as proposed by H.R. 8. 59,159 Iowa families with 139,806 kids would lose $30.5 million if the two 2009 expansions of the EITC — larger credit for families with three or more children, and reducing the so-called “marriage penalty” — are not extended in 2013. These “Making Work Pay” provisions of the tax code are almost exclusively of help to working families earning $50,000 or less at a time of stagnant wages and a difficult job market in which the Iowa economy is shifting toward lower-wage jobs. To address our nation’s serious deficit and debt issues, a balanced approach should do nothing to increase poverty or income inequality. The Senate bill passed last week would keep the EITC and CTC improvements from 2009, and follows that principle. The bill that has emerged in the House does not. Author iowapolicypointsPosted on August 1, 2012 Categories Budget and Tax, Economic Opportunity, OrganizationTags Citizens for Tax Justice, CTJ, Earned Income Tax Credit, economy, EITC, Iowa Fiscal Partnership, Iowa Policy Project, Mike Owen, tax fairness, work supportsLeave a comment on House vote: Thumbs up or thumbs down for 86,000 Iowa families? Iowa Senate to families: Happy Valentine’s Day! The increase would put Iowa into the top tier among the 22 states and the District of Columbia that offer an EITC. The Iowa Senate voted 48-0 on Feb. 14 to approve a significant increase in Iowa's Earned Income Tax Credit. 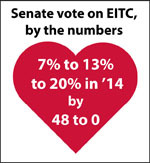 Today, the Iowa Senate sent a Valentine to thousands of working Iowa families, voting unanimously to approve an increase in Iowa’s Earned Income Tax Credit (EITC). Whether the Valentine is ultimately delivered depends on the Iowa House and Governor Terry Branstad, who twice vetoed a smaller increase last year. The Senate-passed bill would boost Iowa’s EITC, which is refundable, from 7 percent of the federal credit, to 13 percent for this year, then to 15 percent in 2013 and to 20 percent in 2014. 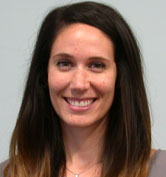 The initial boost, to 13 percent, is expected to cost about $26 million in 2013 and $23 million each of the next three years. No information was immediately available on the cost of moving to 15 percent and 20 percent. For comparison purposes, however, it is useful to note that Iowa gave corporations that pay no state income taxes nearly $45 million in checks last year. In the case of those corporate subsidies, through the Research Activities Credit, there is little or no evidence of a direct benefit to Iowa’s economy nor a demonstrated need for the subsidy. The EITC, on the other hand, is shown in study after study to produce economic benefits for both local communities and working families who struggle to make ends meet in low- and moderate-wage jobs. The increase would move Iowa from one of the lowest EITCs into the top tier among the 22 states and the District of Columbia that currently offer an EITC. Only seven states and the District of Columbia have higher credits under current law than the proposed 20 percent for Iowa. This table in a recent report by the Iowa Department of Revenue illustrates what various states offer for an EITC. Author iowapolicypointsPosted on February 14, 2012 Categories Budget and Tax, Economic Opportunity, OrganizationTags Earned Income Tax Credit, EITC, Iowa Fiscal Partnership, Iowa Policy Project, Lily French, work supports, working familiesLeave a comment on Iowa Senate to families: Happy Valentine’s Day!